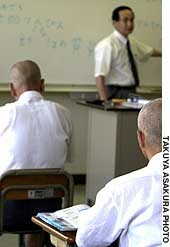 The men in uniform white shirts and dark shorts sitting in the classroom looked too old to be junior high school students; some had gray hair, close-cropped. The students are attending Kiri Branch School of Asahi-machi Junior High School, the only junior high school in the nation run inside a penitentiary. The students are inmates who never completed compulsory education. This unique public school was opened in Matsumoto Juvenile Prison in Nagano Prefecture in 1955 to educate young prisoners who had not finished compulsory schooling, some due to war and social upheaval. In recent years, the average age of the students has been rising, with some in this year’s class in their 60s. The inmates are transferred in from penitentiaries nationwide. Since the mid-1990s, four Vietnamese who came to Japan as refugees have entered the school, officials said. The six prisoners attending the school this year include a Vietnamese man in his 20s. The three-year junior high curriculum is crammed into a single year of study, making it especially difficult for foreign and elderly inmates who have difficulty reading and writing. The students attend seven 50-minute classes each weekday and can also study in their cells until 9:50 p.m.
“(The Vietnamese inmate) always opens his textbook in his cell as soon as free time begins,” a prison official noted. The prolonged economic slump has had a direct effect on unskilled foreign laborers, including refugee families who have settled in Japan. More refugees from Indochina are finding themselves in prison in recent years, Justice Ministry officials indicated, although they could not provide specific nationwide data on their numbers or possible motivations for committing crimes. Upon their arrival in Japan, people accepted as refugees from Indochina participate in a six-month orientation program that teaches them the Japanese way of life, language and other basic survival skills. At present, there are around 70 people, mainly settlers from Indochina, living and studying at the Refugee Assistance Center in Tokyo’s Shinagawa Ward. The facility, home to more than 1,200 refugees at its peak, is in an isolated industrial area. Even taxi drivers barely know the area. 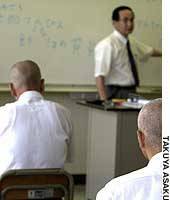 After completing the program, many adults have little opportunity to further their Japanese-language study; for many this is because they must seek out manual labor jobs that do not require advanced language skills, according to workers at the center. Once employed, the settlers often have little interaction with the Japanese around them and become too busy making ends meet to pursue further studies, they said. Some 31.5 percent of the 1,593 settlers from Indochina polled said they had experienced “financial difficulties” in Japan, according to a 2000 survey by the government-affiliated Refugee Assistance Headquarters. A separate survey of refugees recognized by the government under the international refugee convention — not including settlers from Indochina — showed that 39 of 100 pollees were unemployed, while most of the remainder had part-time jobs. This poll was conducted between 2001 and 2002 by Japan Association for Refugees, a nongovernmental organization. Those who run afoul of the law and end up in prison are often unable to undergo training for skilled employment while inside due to their poor language skills, putting them further behind, an official at a prison near Tokyo said. There has been an increase in the number of Vietnamese serving second or third prison terms, the official said. Staff at Kiri Branch School said they hope their education program will arm students with the skills to find gainful employment and reduce the chance of them becoming repeat offenders. The lack of a junior high school diploma is a huge practical inconvenience, particularly as it is often required as a minimum condition for people applying to take exams to obtain professional qualifications. Toshio Sumiya, who teaches history at the prison school, believes many inmates are psychologically tormented by their poor educational backgrounds. “I suspect their attitude that they are not good enough has led them to a life of crime,” Sumiya reckoned. Sumiya said the young Vietnamese man had expressed a desire to enter high school. “He seems like someone who can’t wait to advance his studies,” Sumiya said. The inmate sometimes tells his class about the history and culture of Vietnam. “Foreigners have knowledge that we do not possess. Therefore, I believe they could be an important human resource in Japanese society by teaching us things — if only they can improve their communications skills,” another school official said.